August 8, 2016, 12:47 PM · Where was Edward Klorman when I was drowning in frustration during music theory class? I've always come to music as a violinist -- a one-line player in an orchestra or ensemble. Reading was just a means of getting the music into my head and into my fingers, and though I felt like I had a deep understanding of harmony, it was completely instinctual and experiential. In theory class, everything was so...well, theoretical. The chordal analysis, the intervals, the key signatures, the modes, and later on the tone rows ... they seemed so detached from the music I knew and loved. My analysis homework could be done in the complete absence of actual music, like a set of trigonometry problems. 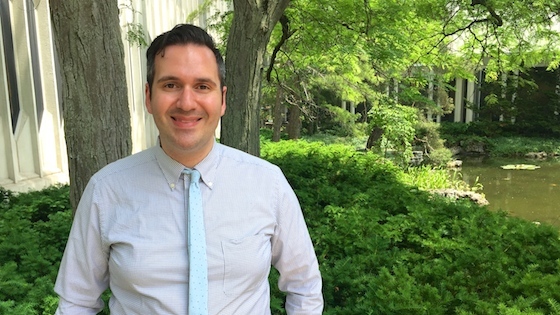 Not so for Klorman, a violist and music theorist who will be teaching this fall at McGill University in Montreal, after 16 years teaching theory and viola at The Juilliard School. For him, theory is steeped in playing, performing, and history. "Performing -- the stuff I know in my fingers -- was the catalyst for me to learn history and analysis," Klorman said. Take, for example, the time he was playing Mozart's E-flat piano quartet, and they came to the second theme in the first movement. "It's this very intimate duet between two parts, starting with the violin introducing the melody, and the piano right-hand only. So you think, okay, it's going to be a duet for the two of them, they'll finish the melody and then the whole group will repeat it. But it keeps going a little bit off course, it keeps trying to make a cadence and the cadence keeps not happening. Then the cello and viola join in, now it's the full ensemble playing, and what is the viola doing? It's just holding the note F, just one long note, and you think it's the least important part of the texture -- until you realize that the way harmony is set up, so long the viola is holding F, the harmony can't advance to the next harmony it needs to go to." "As I played that note, I felt the longness of it, that the violin was trying so hard to move to a harmony that will reach a cadence, but I'm just holding this note! The viola is like the person in the room who is being inconspicuous -- the person who knows what they could say that would help the conversation advance, but they're choosing to withhold it," he said. "They're asserting themselves in a very coy way. I felt really satisfied, really smug holding that note -- and I wondered, why is this? That led me to the observation: the harmony can't progress until I'm willing to let it, and that's a kind of interesting power, to be controlling the whole scene and no one even notices. The physical experience of playing a long note while the others are doing all this stuff, that led me to the analysis." Edward Klorman. Photo by Violinist.com. Last spring, Klorman released a book called Mozart's Music of Friends, a work that offers many examples of this kind of all-encompassing analysis. He asserts that the music of Mozart's time was written as a conversation between friends, at a time and place where conversation was high art. Instruments represent characters, and theory helps explain the drama of the music. He also gave a lecture by the same name at the American Viola Society Festival at Oberlin in June. In 1829 the famous German writer Goethe described the string quartet as "a conversation among four intelligent people." That quote was the catalyst for Klorman's research, PhD dissertation and resulting book. "I was was struck that a lot of music theorists are pianists or composers," Klorma said. "A pianist who is playing a sonata has the full texture, from top to bottom. They have an omniscient vantage point, with respect to the score. I've always thought, 'I'm at such a disadvantage to them, if only I played piano better I would listen contrapuntally better, I'd memorize music better, I'd know more music.' Then I realized: I have an experience they don't have, which is sight-reading a piece I've not heard before, from the viola part. I see certain things in my part, and I wonder, is this where I lead? Or if I have this, does the second violin exchange that with me? So the idea of exploring from a partial map of the piece is exhilarating and exciting. I realized, this is how that music was conceived, because the musicians who played in the 1780s in a quartet probably played it for the first time and last time. So it's almost like they're reenacting the improvisation of the piece, in a stylized way. Built into the piece are surprises, not just for the audience, but also for one another. Imagine you get to the end of the Haydn 'Joke' quartet -- it ends sort of in the middle of a phrase and you wonder, 'Where is the last page? That is the last page!?' The joke's sort of on us!" Another thing Klorman realized was that during the time of Mozart, conversation was held in high regard. "Today, you can have a conversation on Twitter," Klorman said. "But in (Mozart's) time period, it definitely was an art, it had a lot of social cachet. People might keep a commonplace book, which is a book you write down interesting ideas. Think of Benjamin Franklin's Poor Richard's Almanac, with all kinds of witticisms that you have at the ready to pull out in conversation. It was something you could take lessons in and buy and read books to be better at." "So when people said quartets or sonatas were like conversation, that's paying a really high compliment to the art of playing this music," Klorman said. "A scholar named Mary Hunter said that quartets 'can both simulate and stimulate conversation,' meaning that, as we're playing together, it's like we're conversing. You say something, I respond, maybe in an expected way or an unexpected way. The delightfulness of the exchange between us makes the others at this gathering feel sociable and want to exchange as well. So there is also a parallel play between musical socializing and other social engagement in the same space." Interior with a Musical Gathering, by Nicolaes Aartman, c. 1723–60. Rijksmuseum, Amsterdam. 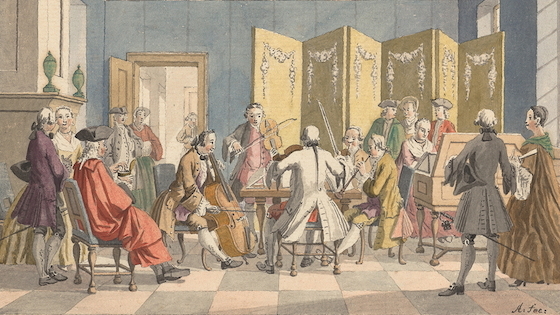 Not only that, but Mozart's music was inspired by specific people and musicians. For example, Mozart's "Kegelstatt" Trio for viola, clarinet and piano -- "It's an unusual combination, it was an unprecedented combination," Klorman said. "That means two things: first, Mozart didn't have any inherited ideas about the instruments' roles, the parts are inventing their personalities as they go. But also, why did he write for this combination? It's for specific friends. Anton Stadler was a clarinetist and his gambling buddy, drinking buddy, and a member of his Masonic Lodge. The pianist, Franziska von Jacquin, was the younger sister of Gottfried von Jacquin, one of Mozart's best friends. She was a piano student of Mozart's. So it was for her, and for gatherings at her family's house that he wrote the Kegelstatt Trio, and the parts interact with each other in such a playful way, is a little bit of their personalities composed into the piece." "When you watch an opera, for example, 'The Magic Flute' -- well, Papageno the Birdman, was written for Emanuel Schikaneder, who owned the theater and also belonged to Mozart's Masonic Lodge. He wasn't really a singer, he was a comic actor who also sang, and so Mozart wrote the Birdman for him. The Queen of the Night was written for Mozart's sister-in-law (Josepha Weber) -- she could sing so high, and also she had rebuffed Mozart when he wanted to marry her. I don't know if that plays into this part that is so stratospheric and hard to sing! Why shouldn't something similar exist in the chamber music that Mozart wrote for particular people? When he referred to his clarinet quintet, he called it 'Stadler's quintet' he never said 'my clarinet quintet.' So these pieces are born of particular friendships, and we get to discover those or reenact them. When I say discover, I don't mean it's no longer my personality, but if you and I are playing a duet together, we should feel invited to experience the same kind of playful interaction, interaction that Mozart surely enjoyed among his friends. It must have been quite a time." "Making music together is a playful thing; there's reason we call it 'to play' music," Klorman said. "I have friends come over so we can play cards, and we play cards so we can have a conversation, or I have friends come over so we can play quartets. That that was the culture where these quartets or sonatas in Mozart's period were played. That playfulness and discovery is something to cultivate, even if today we rehearse carefully and prepare for public concerts. Absolutely we should rehearse and play in tune and have good ensemble, but the playful side is part of what makes this music enjoyable, that's something we shouldn't forget." When Klorman marks up a page with analysis, it's a lot more interesting than my theory homework of old, which contained a dry assortment of Roman numerals for chord changes, etc. Next to his Roman numerals are interesting little notes like, "The suave clarinet insinuates himself into the conversation, displaying the viola..." For example, check out this video below, of his analysis of Mozart's "Trio in E-flat Major for Clarinet, Viola, and Piano ('Kegelstatt'), K. 498." He's set up a webpage of such examples to go with his book. How did he come to this? Klorman grew up in Rochester, surrounded and influenced by the musical environment created by the Eastman School of Music. "As a young kid I heard new music, I heard old music, I heard opera -- and at the time I was interested in composition, just as much as violin," he said. As a fifth grader, he wrote an operetta called "Jodafus" that his classmates performed at school. "At a certain point, my composition teacher said, you know you really should study music theory and get to know some more pieces of music in some more depth," he said. "When I was in high school I was fortunate to take a lot of Eastman's undergraduate college sequence as a special school student. I would go to Eastman in the morning before I would go to high school. Around that time, I switched to viola." "When I got to Juilliard, it was new for me to be around a lot of string players who'd had a more disciplined musical upbringing, which was a more common background for a conservatory person," he said. "I didn't really have that; I got serious playing only as a high school student, when I discovered viola and I discovered chamber music. On the other hand, what I did have was that sense of exploration and being encouraged." Switching to viola made him more curious about the repertoire he was playing. "On viola, we don't have X-many Beethoven sonatas and X-many Mozart concerti," he said. "We often have a lot of questions about the music we have: Who wrote this? Is the edition correct? Are there issues we need to solve? As a high school student I was already asking, how do we know that the notes here in this score are the ones the composer wrote? I was studying the Stamitz Concerto and I knew there were different editions, some which had left-hand pizzicato. So I was thinking, how did this get here? Should I play this? Which one is right?" Being a violist also put him in the center of many quartets and chamber ensembles. He noticed that some of his chamber coaches talked about the instruments of a quartet as being characters. For example, working on Mozart's "Dissonant" String Quartet with Pamela Frank, "Pam would say things like, 'The violin is singing this melody, but then you sort of poke her, and then the cello chimes in...' That resonated immediately with my experience of playing this piece." Another influential teacher was Robert Levin. "Bob Levin would say, 'These first couple bars are so serious, and then this character changes the subject, and then this character modulates to that key...' And it struck me that what they were saying in words is something that a lot of musicians feel," Klorman said. "It also occurred to me, we've all heard string quartets compared to conversation; what we're talking about is something people feel today, but it's also something people felt hundreds of years ago."